Light and lasers; Principles of laser welding and its characteristics; Industrial applications; Materials; Laser welding parameters and their effects; Welding sheet metal parts; Welding plate, tube and pre-machined parts; Single and multi-pass welding with filler materials; Process performance control and monitoring; Work handling, laser beam manipulation and process automation; Optical equipment; Laser safety; Installing and operating a laser - some questions and answers; Glossary of common terminology. Enables the reader both to understand and to use, in a practical manner, laser welding. 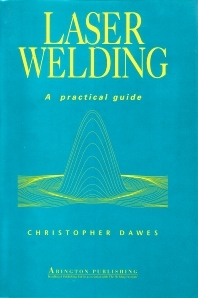 The author explains the principles of laser welding and provides examples of industrial applications, examines many aspects of laser welding and devotes a complete chapter to safety.